Invisible Lingual Braces: Hide Your Braces, Not Your Smile! If you are unhappy with your smile, you have probably at some point considered getting your teeth straightened, but have hesitated because you aren’t comfortable sporting a mouth full of metal hardware at your workplace or social functions. 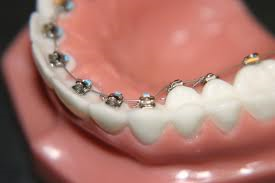 Traditional metal braces used to correct alignment issues are obtrusive. Dr. Gordon Honig, with offices in Newark and Middleton, says “The social stigma attached to the wires and brackets sitting on the front of the teeth is what makes most adults reticent to have their teeth straightened”. Because lingual braces are bonded to the back of the teeth, they have solve this problem. Lingual braces can barely be seen when you smile or eat – they are literally the “out of sight” teeth straightening method that will get your smile noticed instead of your braces. Many well-known celebrities have had lingual braces — who would have known? When celebrities like Tom Cruise, Faith Hill and Gwen Stefani first appeared in public wearing visible braces, it made quite a splash. Now, however, seeing adults wearing braces, whether celebrity or not, has become fairly common. For example, high-profile personalities like Miley Cyrus and Kate Middleton have been photographed sporting lingual braces — hidden braces that are almost invisible to others. What makes lingual braces so discreet is that while they are custom-made, and work the same way as conventional braces, they fit on the tongue side of the teeth. Whether you had braces as a younger teen, but lost or failed to use your retainers, or have finally decided as an adult that you have waited too many years to find the smile you have always dreamed of, lingual braces are the perfect way to correct minor alignment issues. What Can MTM® No•Trace Lingual Braces Do For Me? Crowding –When your teeth overlap, it can be difficult to brush and floss, which can lead to tooth decay and gum disease. Spacing –Too much space between your teeth is an aesthetic issue, which can also compromise the effectiveness of chewing. Tipping –If one or more of your teeth tilt at an angle (forward or backward), it can cause your other teeth to shift and result in crowding. Midline Discrepancy –When the middle of your upper and lower teeth are not in alignment, it can indicate an improper bite. Intrusion / Extrusion — When your teeth are set too low or too high instead of at their ideal position in the “smile line”, it can create wear on opposing teeth and severely compromise chewing. Rotation –Teeth that are twisted clockwise or counterclockwise make oral hygiene difficult, leading to tooth decay. When it comes to aesthetic orthodontic treatment, to get the virtually invisible MTM® No•Trace System experience, you need an expert’s care. With over 20 years in practice, Dr. Honig is one of the few orthodontists in Delaware who are board-certified by the American Board of Orthodontics. His expertise has led him to be ranked as the top orthodontist in the Newark reason by “Delaware Today”. When it’s time to let your pearly whites shine, with the help of lingual braces, contact Honig Orthodontics for a complimentary new patient exam at one of our two convenient locations in the Middletown and Newark areas. (302 )696-4020.